I bought some vegetables for home at Tiruvanmiyur this morning. 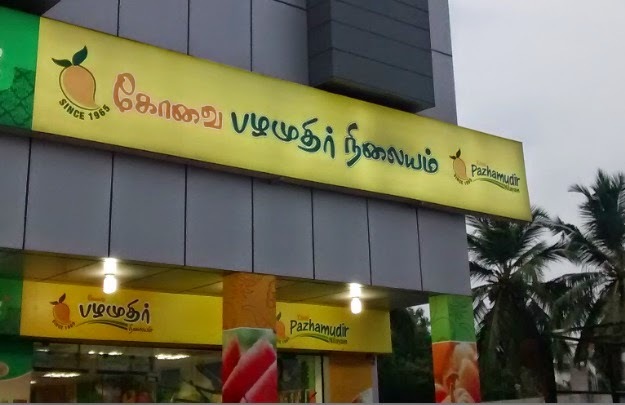 Evening when I went for a walk, entered a branded vegetable shop- Pazhamudir Nilayam with an idea of comparing the prices. Branded shops will definitely be expensive because they have more overhead costs- staff salary, AC, rental etc- I was expecting 10-15% difference, but I was surprised to find almost two times the pricing in some cases. Since most of us do not have the time and patience to compare the prices and blindly believe in display price shown in super markets, I felt I should publish a post comparing the prices, so that consumers will have an idea of what they are paying. Of course there aren't too many standards in fruits and vegetable pricing. Price varies by quality, freshness and demand/supply equation. Also measure can vary- few sell per kg, few sell in loose units. In below table, between Tiruvanmiyur market and Pazhamudir, I have ensured to use price of same quality item. The last two I can't check quality online, so have picked up most relevant item from their site for comparison hoping they are of best quality. Note: Prices are as observed on 17th May 2015. May change over time. There's also an argument that buying from local shops helps in livelihood of poor people while buying at branded shops adds to the kitty of corporate big shots. Probably true, but local shop owners should try to adopt few basic principles such as hygiene, quality, fairness in weight and pricing etc. Another alternative is to order online, prices are little expensive than wholesale market but if you trust the brand you can try them. In my personal opinion, visiting the vegetable shop/market in person at least gives you some exercise and gives you a sense of what's latest in the market, which fruits are having its season and so on. What are your thoughts? Where do you prefer to buy? Something sounds fishy... where did you click? In the RSS feed reader? or somewhere in the blog? what was the text on which you clicked? My experience is that every shop will have one or two items ( loss leaders) at slightly less price that they will highlight. Same for Online shops and departmental stores and then they will charge more or less same price for other things. the local market generally has the best produce -ofcourse it will not be sugarcoated with A/C etc which some ppl are crazy about. Hygiene is something being stressed about by the PM ,its basic common sense ,keep your surroundings clean.The better they keep it -better for health of everyone. Also you might be surprised ,its a growing trend 7/10 people dont ask what is the price ,they just blindly pick it up ,and then pay whatever the seller quotes. Worst is the price of potato which has the longest shelf life.But at the end of the day (i forget the exact term used in econmics) it all boils down to how much the consumer is willing to pay. I was having a similar conversation with my husband the other day - India had become consumerism driven as opposed to what it used to be - a Savings driven community. While we still think more than once about whether we need something or whether we just want it the younger crowd seems to be thinking less that way. We were taught to fix something that was broken rather than throwing it away and getting a replacement. Which is why I am more drawn to the minimalistic way of life where people choose to quality over quantity and yet stick to the basics. Sorry about the redirect issue. Not sure what I can do about it at the moment- disabling feed isn't an option. Will check for a solution if available. Was it one time or happens all the time? @Prasad: True.. The cheaper ones are kept at the most visible spot..
@The Wild: I am not surprised many do not question the price in malls and branded stores, though they argue for a rupee or two with road side vendors. Thank you so much!! I was tirelessly searching for these online in Chennai and you just solved my problem.. thank you again.. In Mumbai,I tried eBaajaar App to compare local market price for fresh vegetables and fruits. It worked well for me. eBaajaar is another android App, which helps you to compare local fresh vegetables and fruits seller's price in Mumbai. It really helpful and easy to compare, bargain and order.